Everyone knows that saying "Beetlejuice" three times in a row will summon a disheveled Michael Keaton in striped pajamas... or something like that. But soon, just saying "Beetlejuice" once will conjure up a $14 tequila cocktail of the same name at a new Tim Burton-themed bar poised to open in the East Village this month. That's right, folks, it's showtime. From the same dudes who blessed the city with a glorious Will Ferrell-themed bar last fall, now comes an appropriately gothic homage to Burton films like The Nightmare Before Christmas, Alice in Wonderland, Edward Scissorhands, and, of course, Beetlejuice: Beetle House (308 E 6th St). 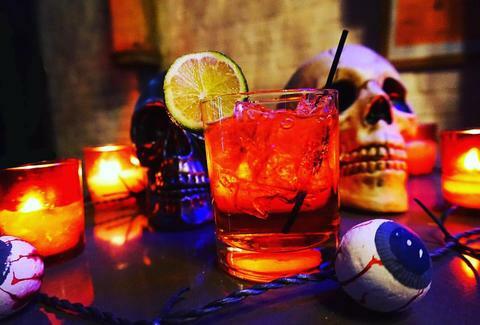 As you can imagine, the bar's food and drink menus are full of subtle and not-so-subtle references to the director's many iconic films, with drinks like the aforementioned Beetlejuice, a Mars Attacks-themed drink called "We come in peace," and a simple bourbon-based Scissorhands-inspired beverage called "Edward’s lemonade." As for food, you can expect dishes like "Sweeney Beef," "Edward Burger Hands," and the "Love It Meat Pie." According to a post on the Beetle House's Facebook page, the bar's preview week starts this Wednesday, April 27th, and dining is by reservation only. Unsurprisingly, it looks like Beetle House is already booked through May 1st, so if you're interested, well, you should jump in the line and get on that. Check out the video below for a sneak peak at some of the most iconic cocktails. Tony Merevick is Cities News Editor at Thrillist and wonders how many times they'll play "Jump in the Line" in a night. Send news tips to news@thrillist.com and follow him on Twitter @tonymerevick.